Sony has unveiled the Xperia Z2 Tablet at MWC 2014. At just 6.4mm thin Sony claims it is the thinnest and lightest waterproof tablet in the world. The new Z2 Tablet is more than just a simple upgrade over the Z1 Tablet, instead Sony has totally refreshed the internal specs whilst drastically reducing its size and weight. On the front there's a new 10.1-inch Full HD Live Colour LED display which drastically improves colour performance over previous Xperia devices, the same technology can also be found on the new Sony Xperia Z2. Inside that 6.4mm body there's a powerful Snapdragon 801 2.3GHz quad-core processor whilst a dedicated GPU and the ability to pair a PlayStation 3 controller should make gaming a breeze. 3GB of RAM are on tap to help with multi-tasking whilst a huge 6,000 mAh battery will reportedly provide 10 hours of continuous video playback and over 100 hours of music playback. Media remains the focus throughout as Sony has also included dedicated Surround Sound technology for the speakers whilst built-in digital noise-cancelling means that when paired with Sony's own noise-cancelling headset you won't hear anything except what's playing on the tablet. If tablet-based photography is your particular cup of tea then Sony has helpfully obliged by including a 8.1MP Exmor RS sensor along with HDR and Superior Auto Mode. For video-calling and 'selfies' there's a 2.2MP front-facing camera. 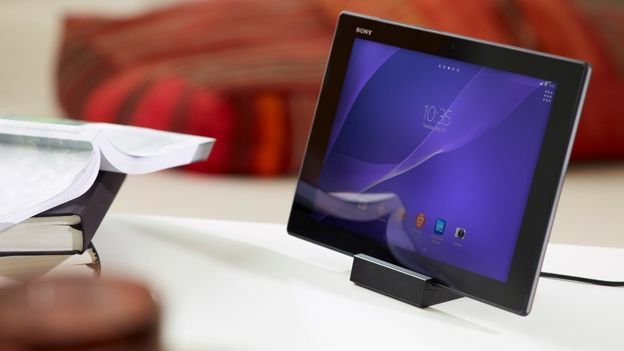 The Xperia Z2 Tablet will be available in March and although there's no word on UK pricing as yet it'll almost certainly be looking to compete with the Galaxy Tab 2 and Apple's iPad Air.